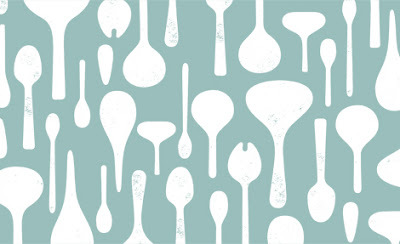 Yes, I can also hear the echoes of my Borrowed Spoons design ringing loud and clear, but I only saw Salvia’s beautiful spoons after my design was finished, teatowels were printed and awaiting their launch. Promise! Read more about Salvia’s commitment to reviving Japanese traditional crafting techniques, and about their other design collaborations in this PingMag article. Late addition: After a couple of well-meant comments from readers, I thought I’d better just make it clear that I was not in the least worried that Amy, or anyone else, thought I’d ripped off the Salvia design, and that was not at all the intention of Amy’s email to me. I just wanted to show the strange echos that sometimes happen. Apologies for not expressing myself clearly. Haha! Oh dear, I knew it was only after, and no, there is no comparison about it and yours whatsoever. 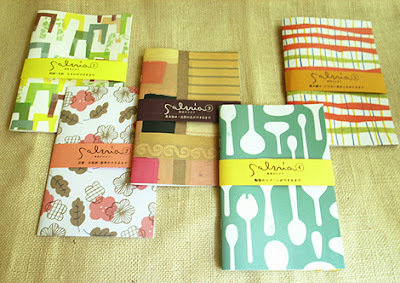 It was just a lovely coincidence that I posted about it, and you printed your lovely Borrowed Spoons Designs teatowels. 😉 Muahks! The similarity between Borrowed Spoons and the Salvia design is striking, however, I believe nobody owns a pattern theme (nobody can claim the spoon theme to be their own!). I think it’s all about different approaches to the design process. Heather had her own, we all witnessed it and had such a nice outcome. I like them both, and actually think they’re quite different. Yep, it’s all spoons, but that’s about as far as the similarity goes. Your Borrowed Spoons are totally different. I can imagine though you feel a bit uncomfortable. I’ve read some posts about these coincidences lately. I designed something with selvedges and two days later I see something simular on a blog. I had not posted about it yet, but I didn’t enjoy the project anymore. I do like a good succulent plant, which must be why my studio roof garden is getting bigger, and also why my camera seems to be full of succulents pics.